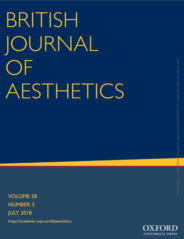 Founded in 1960, the British Journal of Aesthetics is an international forum for debate in philosophical aesthetics and the philosophy of art. The Journal is published to promote the study and discussion of philosophical questions about aesthetic experience and the arts. The 2018 movies Crazy Rich Asians, It, Black Panther, The House with a Clock in Its Walls, Mary Poppins Returns, and Beautiful Boy have very little in common with one another, except the fact that all are based on popular books. More than half of the top 20 highest grossing films in the UK from 2007-2016 were based on books or comic books. The Publishers Association estimated that movies based on books make 43% more than movies based on original screenplays. However, for moviegoers who have read the source material, there is often the risk of disappointment in going to see such adaptations. What if the film fails to live up to the book? It is quite natural to want the movie to be true to the book, and surely it is not unreasonable to judge the film in part on how well it meets those expectations. On the other hand, people often say one should judge a movie on its own merits, and pay no attention to matters of faithfulness to the book. The best movies are not necessarily the ones that follow the source material most closely. Careful attention to the source material can make a movie plodding or dull. Sometimes what works on the page simply does not work on the screen. It is possible, however, to reconcile these two lines of thought. To do so, we need to think about some of the different ways that a film can be (or fail to be) faithful to its source. A film can be true to the story of the book; a film can capture some or all of the main characters accurately; a film can realize fully the book’s tone or mood; and a film can be true to the themes of the book. Some of these kinds of faithfulness are good and important in judging the movie; others are not. Let’s consider stories. Some adaptations take great pains to make sure that the films follow the story of the original very closely – that the events of the movie are the same as the book, sometimes even preserving the same dialogue, such as The Hunger Games (2012); Gone Girl (2014), and the BBC mini-series adaptation of Pride and Prejudice (1995). Most movies do need to abridge the stories of the books somewhat, since movies are usually about two hours long, and most novels and plays would take far longer to act out – thus the desire to adapt Pride and Prejudice as a miniseries. However, beyond issues of length, it is not hard to produce a movie that is faithful to the story of the original: cast actors whose appearances match the descriptions of the characters in the book; follow the book’s ordering of scenes, dialogue, and action; choose costumes and setting that fit the descriptions given in the book; and so on. Now consider the kind of fidelity that aims to preserve the themes or ideas of the original book. This means attempting to make a film that foregrounds the same themes, but in a different medium. Doing this is not easy. Consider an example. ‘Atonement’ is … an almost classical example of how pointless, how diminishing, the transmutation of literature into film can be … The main casualty of the film’s long, murky middle and end sections is the big moral theme — and also the ingenious formal gimmick — that provides the book with some of its intensity and much of its cachet. As the title suggests, ‘Atonement’ is fundamentally about guilt and the attempt to overcome it, and about the tricky, tragically imperfect power of art to compensate for real-life crimes and misdemeanors. The main character of the book, Briony, attempts to write in order to work through her guilt, and the novel Atonement itself is part of that process. If the film version of Atonement had been presented as if it were a student film made by the fictional character Briony Tallis, we might at least get a better acquaintance with the theme of using an artistic medium as atonement for a wrong. This would of course mean a departure from the original story, however. It is a creative accomplishment to preserve the ideas of a film from printed page to moving image. But it is not so impressive merely to preserve the story. So we can be right both to say that faithfulness (to story) is unimportant in judging a movie, and also be very concerned to see whether a movie is faithful (to the themes) of the book. Featured image credit: “Stokesay Court” by PJMarriott. CC BY 3.0 via Wikimedia Commons. James Harold is a Professor of Philosophy and Mount Holyoke College, specializing in aesthetics and ethics. His article, 'Value of Fidelity in Adaptation' was included in the 2018 Best of Philosophy collection.